He graduated from the College of Sharia in Riyaadh in the year 1410. He continued higher education for judges and obtained his masters in the year 1413. 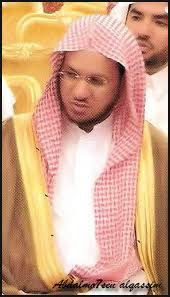 He was appointed as (inherent judicial) in Riyaadh then appointed as judge in the Tabook in the Judiciary of Innovatoin. He was then appointed as Imam of Masjid An-Nabawi in the year 1418 he was moved (as judge) to the city of the Prophet sallallahu alayhi wasallam. The Sheikh has written several books; amongst them are Khutub Al-Munbariyya (khutbahs), Facilitating Attainment in the Explanation of the Three Usool, Book on Hanafi Fiqh, Formulated Annotation of the Masterpiece of (Scholars) in the Hanafi Fiqh and others. Sheikh has dars in Masjid An-Nabawi shareef (sallallahu alayhi wasallam) after salaat Al-Ishaa in eastern expansion of the Masjid. This is a rough translation.